Is a Ghanaian local name given to Kebab, which is also a popular street food in Ghana, Nigeria and other West African countries. 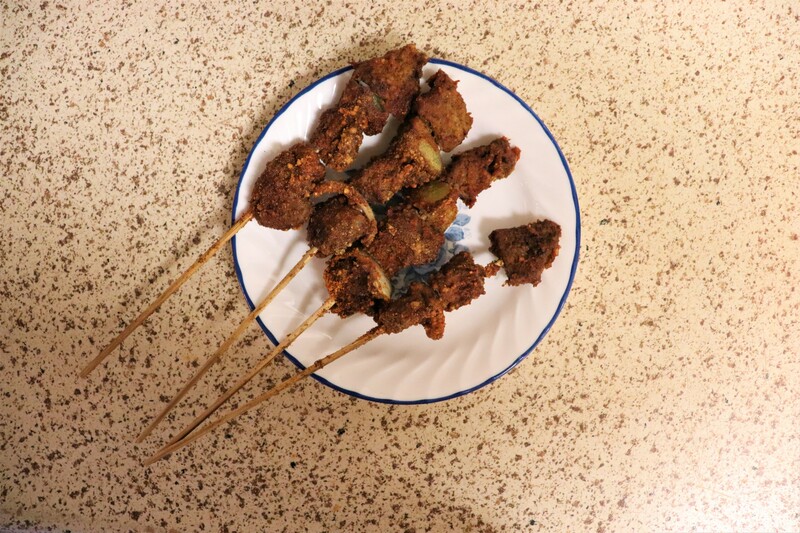 In Nigeria it is called Suya kebab which is slightly different. Kyinkyinga is served in most restaurants in Ghana and sold in almost every corner. I remember when we were kids my dad will take 3 of us kids to this popular Bar / Restaurant in town where will get some delicious Kebabs. And those were some precious child memories for me. In a bowl mix all your spices together to make the great Kyinkyinga powder. Place the baking dish of kebabs in a 350 degree Fahrenheit pre-heated conventional oven. Bake it for about 20 minutes and your best ever beef kebabs will be ready to be devoured! I’m super-excited. My first guest post as a food-blogger was published on Schizo Chef today. 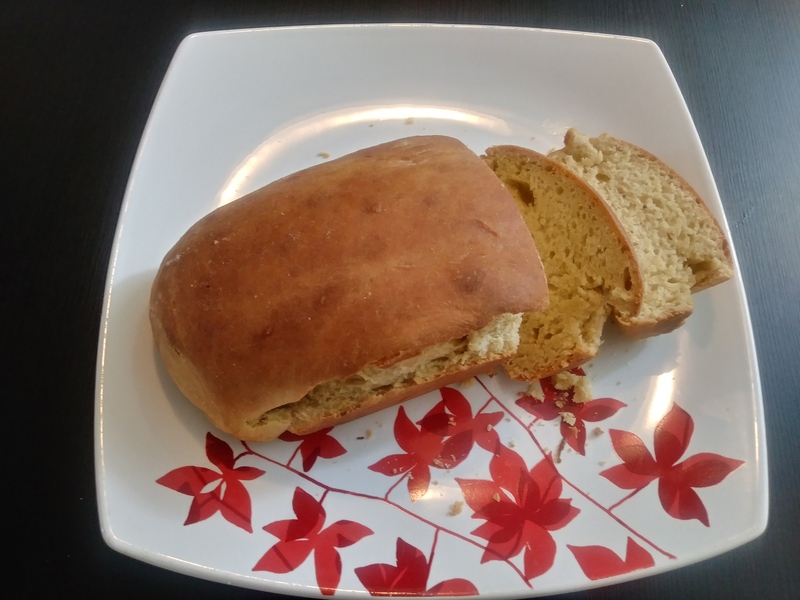 Posted on January 28, 2019 January 28, 2019 Categories West African CuisineLeave a comment on Guest Post on Schizo Chef! Spinach stew is a Ghanaian favorite stew which is usually served with rice, yams and plantains. It was a favorite of our household and we will have it once a week for lunch right after school. What I didn’t like about it was that I’ll stain my shirts and get myself in trouble. 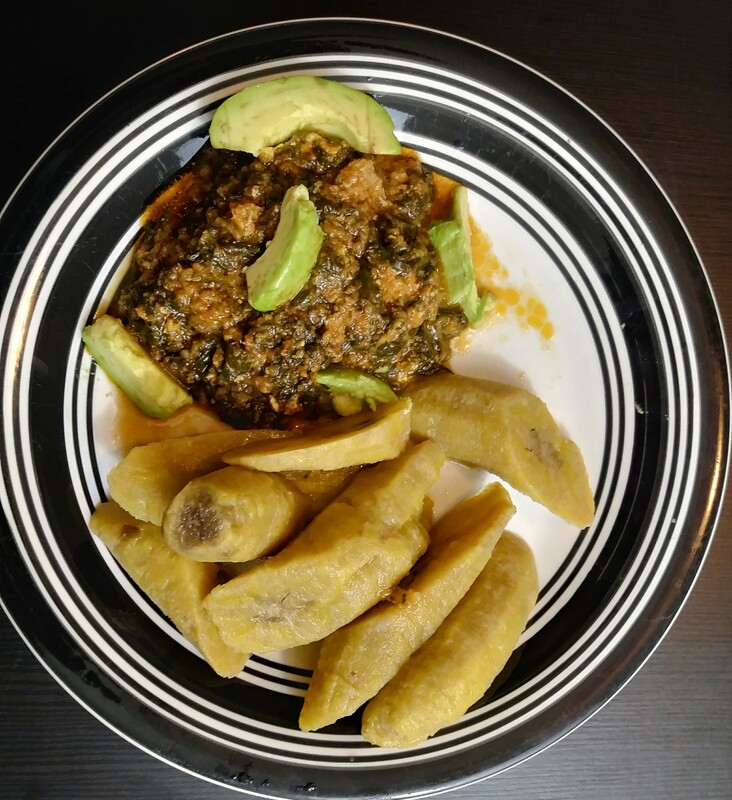 My wife told me when we first met that her favorite food was plantains and spinach stew. So one day I cooked it and invited her over for lunch. She admitted later that the stew wasn’t that great, but I more than made up for it later :). The picture above shows plantain and spinach stew with a few slices of avocados. This is a favorite stew of many Ghanaians, which is made out of Spinach, onions, fresh tomatoes, ginger, garlic, oil, salt, habanero peppers, other spices. It served with rice, yams, plantains, etc. 4 Habanero Peppers You don't have to use as many. Chop up your garlic, ginger and habanero peppers and blend with a little of water. Pour oil in a pre-heated pan and fry your onions for about 5 minutes. Add in the blended produce and tomatoes and let cook for another 5 minutes. Now you can add your spinach, lower the heat to medium and let simmer for about 45 minutes. Because the spinach and tomatoes have a lot of fluid in them and you don't want your stew to soggy. So after about an hour of cooking your world famous spinach stew is ready to be served. Boil one cup of water for a few minutes or until lukewarm and add the salt and a tbsp of honey then add the yeast. Let it sit between 5-10 minutes or until it reacts, it should grow in volume and become foamy. Add the butter, milk, egg, water and mix well. Knead for about 10 minutes until its smooth and elastic. Shape into a loaf and place it in a greased baking dish, cover it up and let it sit for about an hour so it rises. Making sugar bread or any kind of bread reminds me of a woman who sold bread in the neighborhood I grew up in Accra, Ghana. Almost every other day we'll pick up sugar bread fresh out of the oven. And I soon as I got home I would cut a couple of slices and butter them up. Nothing like a warm bread with melting butter over it. Sugar bread gets its name because its made with sugar, duh :). We don't buy sugar anymore but we use organic honey as a substitute. We purchase a jar from the local farmer's market. I don't feel as bad using honey because it has medicinal value. Its a popular West-African street food similar to donuts in other parts of the world. It's called Boflot in Ghana, Puff-Puff in Nigeria and Sierra Leone. Boil two cups of water for a few minutes or until lukewarm and add the salt and a tbsp of honey then add the yeast. Let it sit between 5-10 minutes or until it reacts, it should grow in volume and become foamy. Pour the the flour in a big bowl and add the nutmeg. Mix the flour and the yeast mix together and let it rise for about 45 minutes. Scoop them up with an ice cream scoop or roll them into a ball shape. Deep fry them about 5-10 minutes. Time to enjoy! Earlier this year I learned how to make one of my favorite snacks growing up in Ghana called Boflot. I remember I used to have it for breakfast with some Koko (Corn porridge). or with a glass of hot chocolate preferably Milo. You can get them when you're downtown Accra and you need a quick snack to stave off your hunger. They can also be eaten as an appetizer before your main course at an African restaurant. Its also made in Nigeria and Sierra Leone where its called Puff-puff. Its a little similar to donuts and actually there are a few British I know who call it donuts. Jollof Rice is a highly popular West African rice dish that is made out of rice, tomatoes/ tomato sauce, spices/herbs. Add the tomato paste and 2 cups of water. Stir for a few minutes until the sauce is nice and smooth and let it simmer for about 15- 20 minutes. You can now include the Basmati Rice and let it cook for another 30 minutes. Cover the rice mix with a foil wrap with the saucepan lid over it. The foil traps the steam and allows it to cook a well and faster. Stir the mix every 5 - 10 minutes until cooked. Your world famous Jollof rice is ready! Jollof Rice is a very popular West African dish that has sometimes sparked friendly arguments as to who makes the best Jollof Rice. Jollof rice originated from the Wolof, an ethnic group in parts of Senegal, the Gambia and Mauritania all on the West coast of Africa. Sometime last week a popular food website posted a very diluted version of Jollof Rice which they claimed was Ghana Jollof which really angered a lot of Ghanaians and other West Africans. But my wife and I agreed that getting angry wasn't the solution to combat that atrocity 🙂 but rather we needed to create a video showing a better version of Ghana Jollof Rice. So here you are and have a great week! Extremely ripe plantains mashed and deep fried into spicy cakes. Deep fry them for about 10 minutes or until its like the above shown picture. And your Kaklo is ready to be devoured! This week's recipe is so dear to my heart because it has always been one of my favorite meals. I always looked forward to lunch on Fridays as a kid. Because I knew I was going to be eating either fried plantains or Kaklo with beans stew. Cooked Basmati rice fried with onions, and other veggies. While the rice is cooking cut up your vegetables. Add seasoned salt and Oyster sauce and stir, your fried rice should be ready in about another 5-10 minutes. Serve with a salad and some chicken! Fried rice is one of our favorite meals at home not only because its quick to make but also because its so delicious. I remember sometime 2 years ago was when I noticed my son will come up with a dance whenever I made it. The picture above was my lunch for today, I ate it with chicken and Kaklo (would share the link soon). If you want to eat it the West African way serve it with some shitto , you can thank me later :).